Everyone is feeling festive this time of year, and for these Birth Mommas who are due to have their babies around this festive season, beware of what you may convinced to do about it, yes the induction will be discussed full on with you.The medical industry becomes very induction happy especially during the festive season.Mommas remember please, you have a voice and in this case you are speaking for your baby who has defense on this matter about being forced to being born on someone else’s time frame. Your baby has a right to chose what day to join us here earthside. So let’s go over a few reasons why it is best to avoid these inductions being forced upon mommas for no medical safety reason. Your baby knows when it is time, your baby’s lungs send the signal to get things going by releasing the oxytocin.The contractions brought on by inductions are whole lot different than the ones your body will send naturally, therefore the pain is intensified before your body is ready for it. The side effects of inductions is not mentioned, for instance, Pitocin, which medical providers claim as being the same as our own oxytocin, as several harmful effects such as postpartum hemorrhage, cardiac arrhythmia, pelvic hematoma, hypertension, premature ventricular contractions to name a few.Again, please speak up and ask, before agreeing to anything, it really is not best for everyone. Inductions don’t always work and when they don’t it is Momma who feels she has failed and that is really not the case, with an induction forceps and vacuum extractions are more common not because baby is too big or your body is broken, it is because the Pitocin contractions are so strong that Momma gets worn out and exhausted. These assisted extractions can cause skull fractures, hemorrhage, temporary paralysis of facial muscles are just a few things.Once the induction has been put in motion of course now, Momma is put on the clock to have this baby and if time runs out, the surgical c birth is encouraged. During this festive season the elective induction is becoming a trend, Doctors offer Mommas the option to schedule the birth of baby, of course, this can make things easier, Mommas can plan on being with their family and loved ones for the season. Doctors can also be home for dinner with their families too and not be disturbed by a birth.Sounds like a great idea? Well except that your baby is being deprived of precious time in utero, where the lungs, brain, heart are still not ready. The outcome might mean baby will spend the festive season all alone in the intensive care unit, instead of with loved ones and with you Momma. Not the best way to be welcomed earthside for the convenience of others. 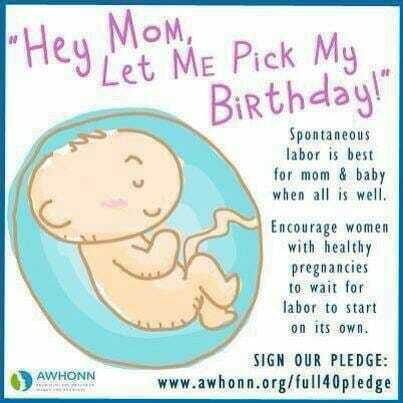 Momma speak up for you and for your unborn baby who has not even been considered. Happy Holidays and Happy birthing! Let baby chose the day! Sources: National Center for Health Statistics,Fit Pregnancy.